World Wide DXer - for verification of at least one shortwave broadcast station in each of 50 different broadcast countries. This lovely interval signal hasn't changed till today, one of the last remaining communist propaganda stations, alongside with Radio Habana Cuba. 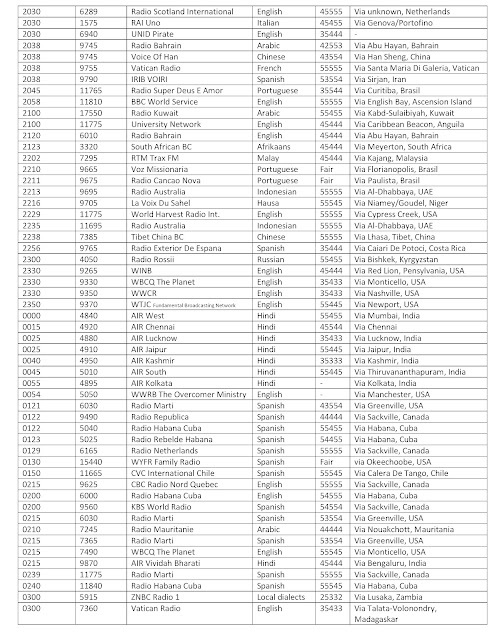 NOTE 1: Frequencies 6080 and 21540 are inregistered. NOTE 2: Registered is 6050 and 21520 respectively. BUT on Friday May 18 morning txion 0601-0846 & afternoon txion 1216-1501! Looking for THE source for the best in DX, Media and Mailbag program ? Look no further - Shortwave Central brings you the Best of the Best in DX programs. Why settle for the rest ? 26 June 2012. The final airing of “Maple Leaf Mailbag” is expected to be on 24-25 June. 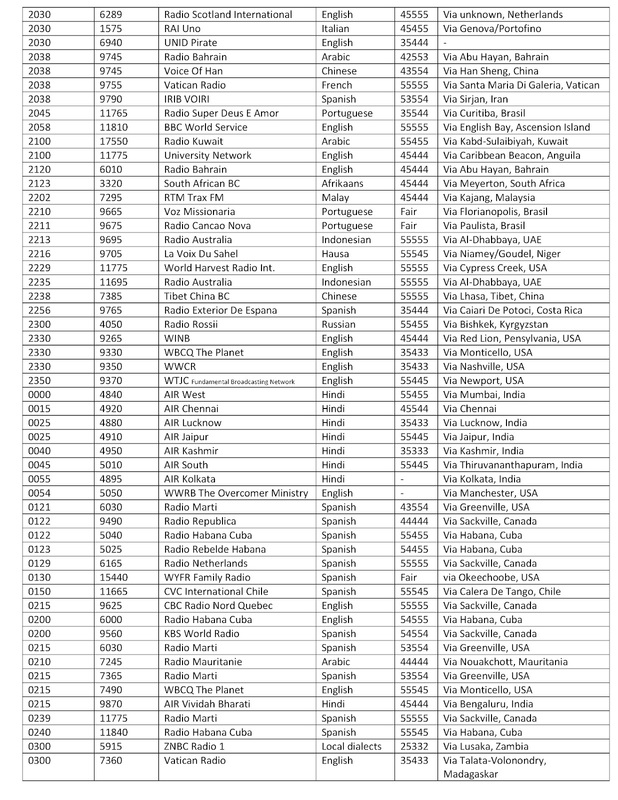 From 28 May onwards for a period of a couple of months, there's a chance you'll hear VL8A running a single-frequency test on 4835 kHz. This is a high-angle skywave, night service intended primarily for a domestic audience within 400 km of the transmitter. The reason for the trial is because the transmitter contractors are unable to maintain the automation system that controls the day-night change-over between 4835 & 2310 kHz. 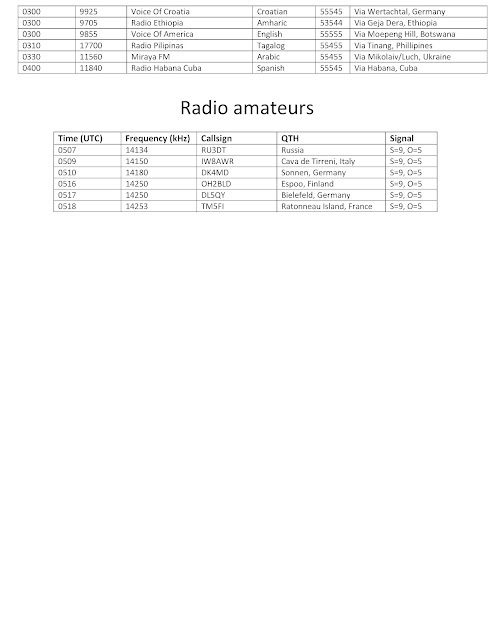 Conversely, if people want to report on 2310 kHz then it might be an idea to do so now in case the test becomes permanent. 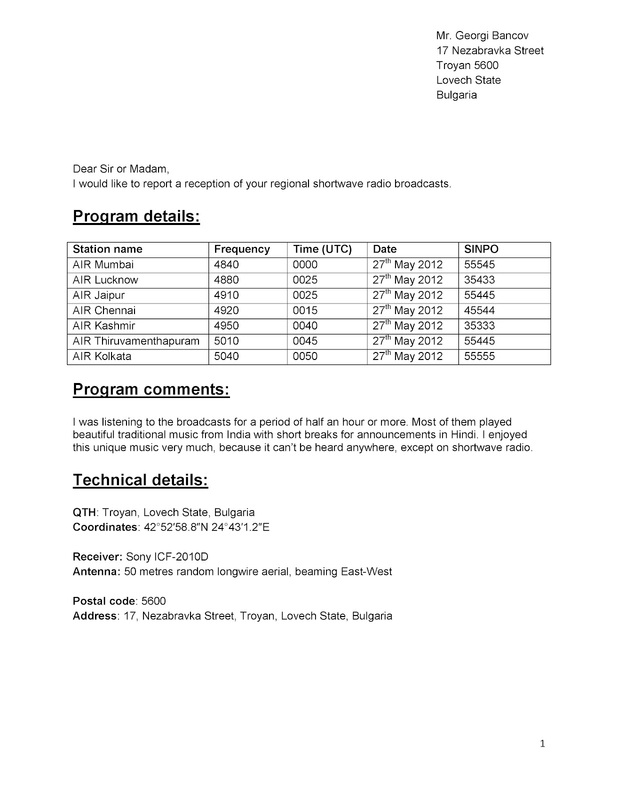 Note that the address above should be used in all instances, and not that of Radio Australia. The times are in local time in Bulgaria (UTC+3). *DRM mode. English sked may be subject to occasional variation day by day. 0330-0427 on  9610 11875 "Voice of Palestine"
0330-0427 on 11920 13650 "Voice of Justice"
1244-1500 on 11650, very strong co-ch 1300-1500 CRI in Esperanto & Amoy. 0700-1000 on 15750 ERV 300 kW / 192 deg to EaAf Sat, please check next Sat! 1400-1430 on 17560 MDC 250 kw / 045 deg to CeAs. Strong jammer from China! 1434-1651 on 11650, co-ch till 1500 CRI in Amoy; 1500-1600 FEBC in Russian. 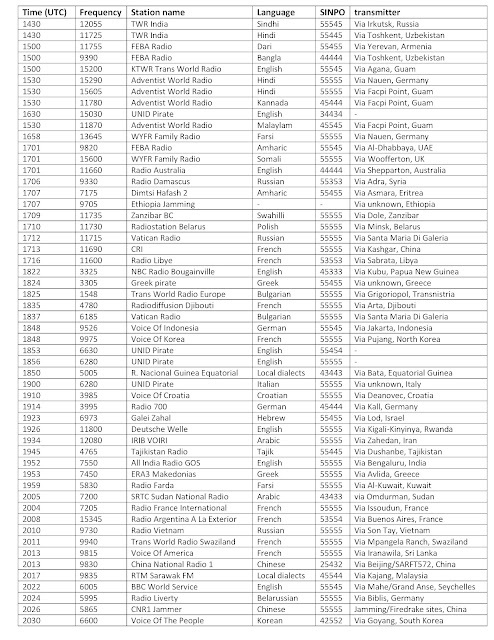 VERY BAD FREQUENCY SELECTION ON 11650, ALSO SAME PROBLEM MORNING ON 15725!! 0404-0621 on 15725, no transmission on May 8, cancelled? 1830-1930 on 15725, no transmission on May 6,7, cancelled? 2000-2300 on 15650, no transmission on May 5,6,7, cancelled? Any ideas? Co-channel interference from Voice Of Russia in Urdu, and later in Hindi. 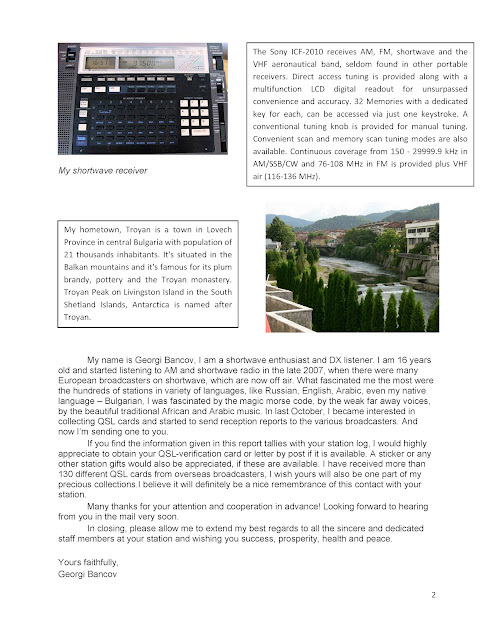 Blagoevgrad 864 BLD 075 kW 0300-2100 Radio Blagoevgrad, local prgr. From Nov.1 or Dec.1 in Bulgaria will operate 7 txs with total power 590 kW. D.P.R.K. Voice of Korea has moved from Winter to Summer sked on April 30. New in the summer A-12: deleted 0000-0357 time slot and added 0300-0657! 1830-1930 on 15725 check on April 25-30. Nothing! UNIDentified transmitter! Apr.27 1456-1602 & 1756-2100; Apr.28 1630-2100, day by day different times. 0300-0600 on 6015 confirmed this morning May 1, but very, very poor signal! 1400-1500 NF 11595 KWT 250 kW / 078 deg, add.freq in Tibetan, not Chinese!